Thanks for that info about Oestrogen an progesterone. It certainly answers some questions. So much great information is available now and it makes sense to use it. I would love to hear about the results of your experiment. Even with an irregular cycle it may make a difference. Soooo frustrating about your Endo. Though from a lot of my reading of patient experiences it does seem that the majority of them are similar. I think that this is how they are taught and unless they experience something themselves they just do what they are taught. It is an enormously difficult decision and it takes courage to take control of your health - especially when some of the symptoms like lack of concentration, foggy brain and fatigue may be so debilitating. There is a really great TED talk by Peter Attia who is a Dr in America. I really admire him doing this talk - it takes courage and integrity. It goes for 20 minutes and he pretty much said that until he had issues in a certain area which for him was increasing weight gain that he wasn't able to fix with the medical model he used he would tell his patients it was because they weren't complying with the regime properly. It is just so frustrating that you can't find someone in close proximity to you who thinks outside the current medical model. They would probably have an enormous waiting list though. Hope it goes really well switching to NDT and you find it enormously successful. I haven't noticed Tipularia on Facebook but she may call herself something different or just be a member and not post. How are your chin-ups going? I started back in October/November and am now up to around 14 which I am so happy about. Increasing my chin-ups is such a slow process and if I miss a week I seem to go backwards but I am pretty happy with what I have achieved so far - most I have ever been able to do. I thought that once I reach 15 I may start to add weight - I saw someone use a backpack with some weights in it and thought it was a good idea rather than just continually increasing the number I can do. And, have you sold any of your photos? How is that part of your life going? (04-12-2018 05:26 PM)FionaSchipke Wrote: Thanks for that info about Oestrogen an progesterone. It certainly answers some questions. So much great information is available now and it makes sense to use it. I would love to hear about the results of your experiment. Even with an irregular cycle it may make a difference. I do have an irregular cycle which can be anything from 26 to 34 days currently. So the first part of my challenge is identifying that “fourth” week effectively. 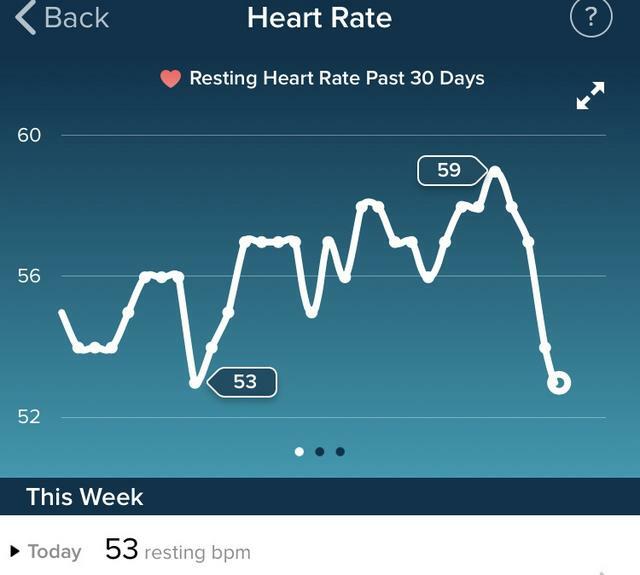 I have noticed that my average resting heart rate tends to drop for three, 4 days prior to period starting. Now this would be highly useful, if it happened every time, but very randomly it only drops once my period has started. This month it has also given me a red herring as it started to drop and then popped back right back up and more. It has however started to drop again and coupled with the info from this mornings lifting session, hopefully I'll be closer to accurately identifying the "fourth week". My current resting HR is 49 so i’m fairly confident it is imminent. (04-12-2018 05:26 PM)FionaSchipke Wrote: How are your chin-ups going? I started back in October/November and am now up to around 14 which I am so happy about. Increasing my chin-ups is such a slow process and if I miss a week I seem to go backwards but I am pretty happy with what I have achieved so far - most I have ever been able to do. I thought that once I reach 15 I may start to add weight - I saw someone use a backpack with some weights in it and thought it was a good idea rather than just continually increasing the number I can do. It was doing the chin ups that I clicked that the 4th week being weaker for me. I went from struggling to crank out 10, then the following week where 9 felt absolutely easy. I’m stuck on 13 and have been for a while. I have used a backpack to add weight, but what I did was shove 15kg in and just focussed on doing as many slow negatives as I could. I have never actually added weight and done traditional pull ups. Like you, when I get to 15 I may try that, but I agree you have to be persistent with them, and progress seems to be slow. It seems to be only us two around here! How you getting on? It does seem like we are dwindling over here. I meant to write October/November 2016 for my start date. I have had a few small breaks since then and my reps go down but even with being super consistent increasing the reps is slow going. And I definitely notice I struggle some days so I will see if there is any pattern. I am actually going really well at the moment. I have made some progress with fat loss and am pretty much back to my happy size. I fit into all my clothes and feel comfortable. I actually do feel that the EFT and specifically working with the book I mentioned and continuing to do EFT around other issues has made a big difference. I spent all of 2016 and 2017 a few kgs and cms bigger than I like to be. And I am in my 2nd year of a part-time Diploma of Counselling which I love. I finish at the end of the year and am hoping to get work in this area. Have you done any photography lately? West, you chin-ups do impress me, seriously! Thanks for sharing the info on the difference on how much weaker or stronger we are according to our hormonal fluctuations. Guys don’t deal with that, but we do and it can make a big difference in our training. i read Rachel Cosgrove’s book and she talks about that. I do feel strongerduring my period. Have you tried sending Tipularia a dm? Maybe it will get through her email. I’m not sure if she’s on the Facebook group. (04-18-2018 05:18 AM)FionaSchipke Wrote: It does seem like we are dwindling over here. I meant to write October/November 2016 for my start date. I have had a few small breaks since then and my reps go down but even with being super consistent increasing the reps is slow going. And I definitely notice I struggle some days so I will see if there is any pattern. My memory is terrible lately so went back and read through your journal and noted that you had started a diploma, so glad that mentioned that you are enjoying it and that you're going to look for work in that area. Time flies though when you do a course! It's over before you know it. It's so nice to be at a weight where you feel most comfortable, it sort of likes gives you an extra boost and then that goes on to have an impact on other areas. I know the saying is love yourself at whatever weight you are and is important thing to learn, but there is just something about being at your comfortable weight . I'm struggling to pick up a camera, the type of photography I love is landscapes which requires an immense amount of energy, as I like remote places, often early starts and right now my energy levels are still low. Think the 3 year degree course burnt me out. I know I could do other types of photography but it just doesn't ignite the same passion in the same way. I'm thinking of buying Lyle's book which is packed with tons of info on women. I prefer books, being able to flick through pages, write on, stick in bits of paper etc etc but the cost of shipping needs thinking about. Kindle version is cheaper but its just not the same experience if you see what I mean. Friday was the day I achieved 15 chin ups, oh boy the 15th probably looked ugly but I was determined to get my chin above the bar. 13 was my previous best, went for 14, got it, and then thought i'm so bloody close to 15 I have to try. Ugly or not, 15 chin-ups is BEAUTIFUL! Woohoo!!! Feeling tired all the time is not easy, very demotivating, I’m not a photographer but I realize that to take nice landscape pics you need to be out early or late and remote locations involve lots of prepping. Not easy when your energy is so low. I’m pretty bad in paying attention to how my strength level change throughout my period, but as I get older I’ve been noticing things that didn’t happen before, like ovulation pain and all sorts of symptoms around it. Almost as bad as having a painful period. I used to say that I wouldn’t have enough time to do it, but I’m realizing that it’s not time that I need, it’s “head space”. The more things I add, sometimes the less I can do. *looks around* quiet in here. I am beyond frustrated and don't know what to do. As of Monday I weighed in at 64.3kg so i've dropped a little over 10kg since end of Nov. I used my calculated TDEE and deducted 12% from that to compensate for my reduced metabolism due to BBT (for every 1 degree c below 36.55 there is a 10-15% reduction in metabolic rate.) Then I deducted my cut value. So not impossible to over come. As you know, I was on a reduced no of total sets per workout and had a rest week about every fourth week. I made my situation work for me. Some days / weeks it was really hard to hit calories because of reduced appetite but I knew what I had to do. Still can achieve 15 chin ups, not every time but i'll get there. Now trying to improve my numbers on the regular pull up which is at 8. My pull up bar design means I can't put my hands where I naturally want to put them for the pull up movement (there is metal protruding out at the point where I want to put my hands) so Im forced to go narrower which doesn't feel quite right or wider which feels more difficult. i'll just have to deal with it. Also set a new PB in the deadlift - 3 sets of 4 @ 115kg. I have just started my first ever true strength programme 5/3/1 in which I hope I can progress further with the deadlift, my favourite lift. (06-12-2018 02:17 PM)West Wrote: *looks around* quiet in here. Hey West, So good to hear from you. That is such great news on a few fronts. It seems we have done similar things. The chin-ups, pull-ups and weight loss. Huge congratulations to you - it sounds like it must have been difficult with everything going on for you - but you did it!! And great news about the deadlifts - you must be happy about that too. I am now around the low 64kg mark also (I am so happy about that - I fit into my clothes comfortably again). It fluctuates a bit but around there. And I am doing around 18 chin-ups now (I really need to take a weight down to the park - someone suggested that I tie a rope around my waist and I could attach a weight to that). I can do around 8-10 pull-ups too. I am sure you would be able to do more if you were able to get a comfortable position on your pull-up bar. The medical side of things are seeming to drag so much for you - but at least they seem to be moving sort of in the right direction. (06-12-2018 06:04 PM)FionaSchipke Wrote: The medical side of things are seeming to drag so much for you - but at least they seem to be moving sort of in the right direction. Still stuck on 15 chin-ups but not too bothered. Had an appointment last week with an Endocrinologist (finally!) I went well prepared with spread sheet of every thyroid test result, faulty gene result and a few research papers. All prepared for a fight and after looking at my test results he just said: "How much t3 would you like?!" Nearly fell off my chair. So I walked away with a prescription there and then. The relief was immense, I can tell you. Hey West, I am so happy to hear you finally found a competent endocrinologist. That will take a long-term stress away hopefully which will help too. Have you been doing much photography? 15 chin-ups is fabulous and it may just be a plateau for a short time.